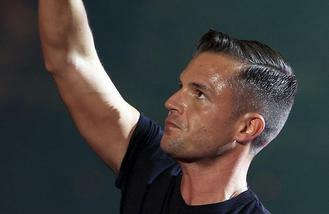 The Killers will have new material to perform when they play British Summer Time Hyde Park on July 8. The 'Smile Like You Mean It' rock group's drummer, Ronnie Vannucci Jr., has revealed they are nearing completion of their first record since 2012's 'Battle Born', and although it may not be ready for the festival held at London's Hyde Park, they will definitely have some new songs to share with their fans. Speaking to NME magazine, Ronnie said: "It's sounding good. "We have a problem with taking two steps forward and one step back, so that makes it take longer. We keep asking ourselves: 'What does a four- piece band do? How do you keep it fresh?' It's a constant exercise in experimentation." The group - also comprised of frontman Brandon Flowers, guitarist Dave Keuning and bassist Mark Stoermer - are perfectionists when it comes to their music and want to make sure the new stuff is out of their comfort zone. He explained: "We're trying to arrive at something we're all just a little bit uncomfortable with. When everyone is slightly uncomfortable, then we know we're there. "We're just pushing it in different directions, then bringing it back and trying another direction." Asked if they'll have new music for the summer show, he added: "By then we'll have some new s**t for y'all." Singer Brandon previously teased that the record is sounding "heavier" than any of their previous work. He said: "There are moments that feel heavier than anything we've ever done, not that we're the heaviest band in the world, but they have a finesse because of our experience. "There's also really beautiful things. Lyrically, it's really close to home." They are 'Rut', 'Run For Cover' - which came from a session they did with producer Stuart Prince in 2004 for their third studio album, 'Day & Age' - and one about boxing legends Mike Tyson and Buster Douglas' famous fight in 1990, which is named 'Tyson Vs Douglas'. He explained: "There's one called 'Rut' and were all kind of excited about what was happening with that. "Another is called 'Run For Cover' and that comes from 'Day & Age'. "So it's eight-years-old. It started with Stuart Price and it's still sort of has his stamp on it - but we're funnelling it back through the band eight years later with a different producer." Danger Mouse says Gnarls Barkley's reunion was derailed by the election of President Donald Trump. Vanessa White was forced to delay her second solo EP 'Chapter Two' because of a legal case. Ed Sheeran has been trying for five years to land a cameo role in TV show Game of Thrones. Nelly Furtado is planning on retiring from music. Rapper Tyga is reportedly taking some time away from his reality star girlfriend Kylie Jenner. James Arthur has announced his first ever UK arena tour. Drake is set for a return to acting in gritty British drama Top Boy, after buying the rights to the show. Jennifer Lopez has taken the next step in her relationship with Alex Rodriguez, by introducing him to her mother. James Blunt injected some of the late Carrie Fisher's wit into his LP 'The Afterlove'.